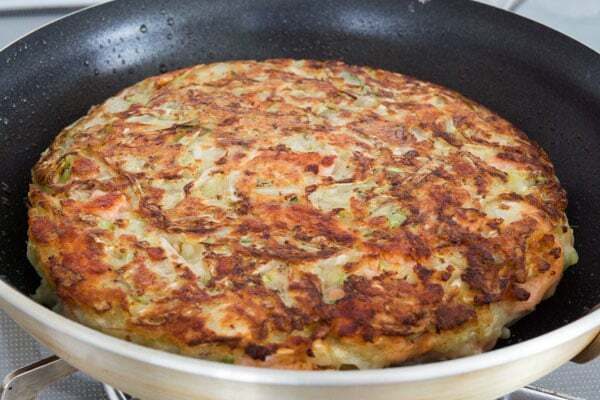 Okonomiyaki (お好み焼き) literally means "grilled as you like it", and is a savory Japanese pancake, loaded with veggies that can be customized based on what you have in the fridge. Okonomiyaki (お好み焼き) literally means “grilled as you like it” in Japanese. As the name implies, what goes into it and how it’s prepared depends largely on your preferences. That’s why it’s sometimes known as a “Japanese pizza” in the US. 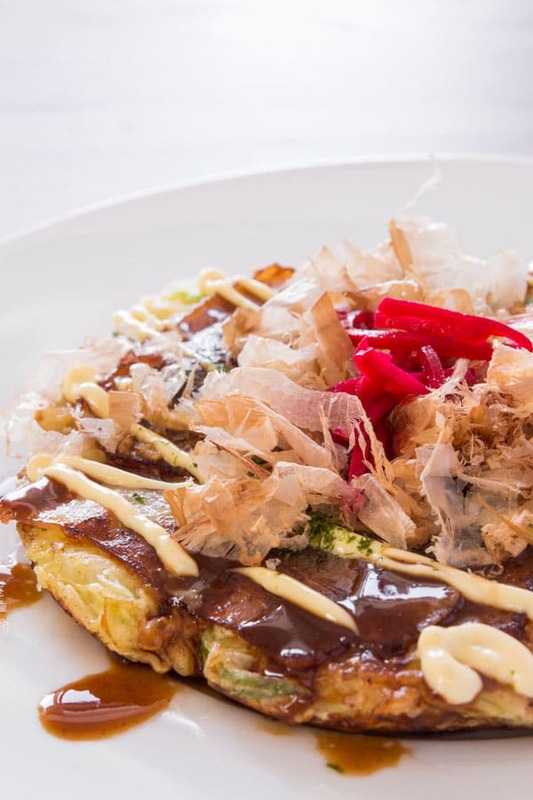 In most versions okonomiyaki is made with shredded cabbage and a pancake-like batter, but that’s where the similarities end. Some people like a soft custardy interior, while others prefer a ton of fillings with the batter merely binding the ingredients together. Since there are no hard and fast rules for the filling and toppings, it’s a great way to use up scraps from the fridge. That said, there are a two general styles of okonomiyaki: Hiroshima-style and Kansai-style. Hiroshima-style okonomiyaki is layered like a giant omelette and often includes yakisoba on the inside, with a fried egg on top. Kansai-style okonomiyaki on the other hand is mixed together before being cooked like a pancake. 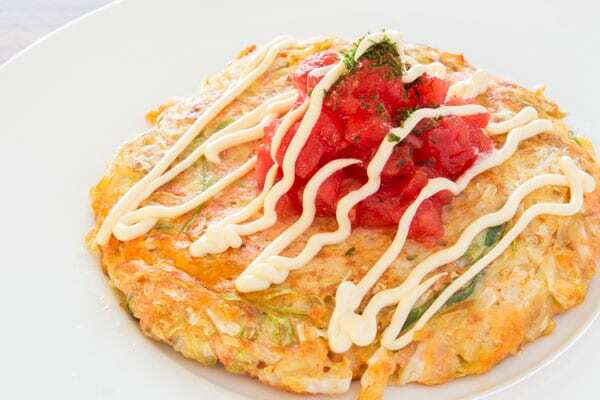 Nagaimo, which literally means “long potato” is a key ingredient in Kansai style okonomiyaki. It’s a species of yam consumed all over Asia. In Japan, it’s often eaten raw in salads and grated into sauces, but it has a thick mucus-like texture that tends to put people off who weren’t raised eating it. When cooked though, the sliminess dissipates and it provides a wonderful moist, creamy quality to batters like this one. One thing to remember though is that if you have sensitive hands, be sure to wear food-safe gloves when handling nagaimo as it can make your hands itchy. Another key point to getting a soft custardy Kansai-style okonomiyaki is to limit the development of gluten in the batter. That’s why it’s important to minimize mixing once you’ve added liquids to the flour. I’ve found that mixing the flour in with the cabbage first, and then adding the liquids, keeps the mixing to a minimum while evenly incorporating all the ingredients. Once cooked, the pancake is slathered with okonomiyaki sauce, though chuno or tonkatsu sauce are both similar and work perfectly fine). Typical toppings include Japanese mayonnaise, aonori (green nori flakes), katsuoubushi, and benishouga (red pickled ginger), but similar to the filling, what you put on top is largely up to your own preferences. Chili sauce, cheese, and even curry are fair game, making it a lot of fun to pair condiments with what’s inside each pancake. I’ve outlined the process and ingredients for a very basic okonomiyaki below, but like pizzas, it can be filled and topped with anything you like. 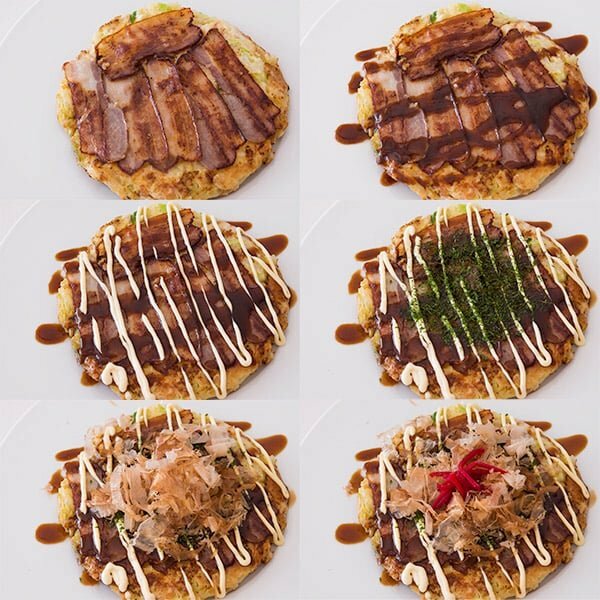 Here are some ideas to show you how versatile okonomiyaki can be. Make the basic okonomiyaki below (minus the bacon), but add mentaiko and cheddar cheese to the mixture. 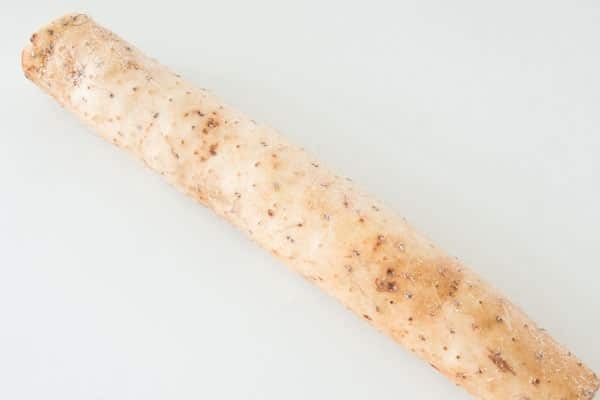 The mentaiko adds spicy bits of salty pollack roe in every bite, while the cheddar melts, to form pools of cheese on the inside and crisps on the outside. Topped with chopped tomatoes and mayonnaise it presents beautifully and adds a fruity sweetness that goes well with the cheese. Make the basic okonomiyaki below (minus the bacon), but add smoked salmon and thyme and top with hollandaise sauce and aonori. 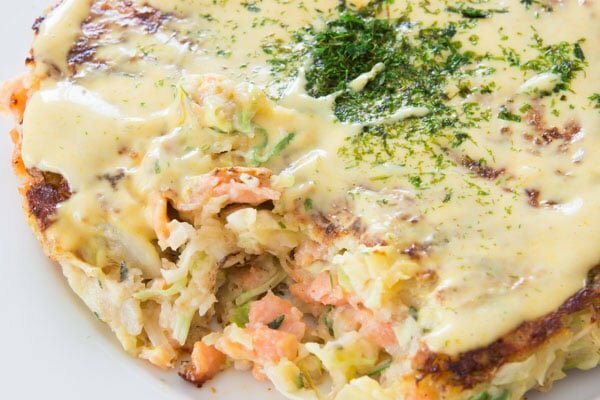 With salty, smoky bits of smoked salmon in every bite and a tart creamy hollandaise sauce, this tastes more European than Japanese, but that doesn’t make it any less delicious. Remove the core and tough parts of the stems from the cabbage and shred it. 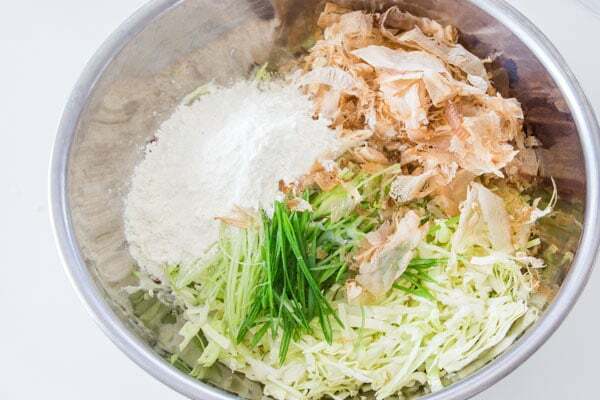 In a large bowl, combine the shredded cabbage, scallions, katsuobushi, and all-purpose flour, tossing with two large forks or your fingers to distribute everything evenly. Peel the nagaimo and grate it into a separate bowl. You can also roughly chop it and puree it in a food processor. Add the eggs and dashi, and whisk together until the everything is uniformly incorporated. If you want to add other filling ingredients, this is the time to do it. Decide whether your additions will incorporate better into the dry ingredients or wet ingredients and mix them in accordingly. Pour the wet ingredients into the cabbage mixture and stir together until all the cabbage has been moistened and there are no large lumps of flour, but be careful not to overmix. It's fine if there are still some small clumps of flour. Lay out the bacon in a cold pan, overlapping slightly to account for shrinkage. 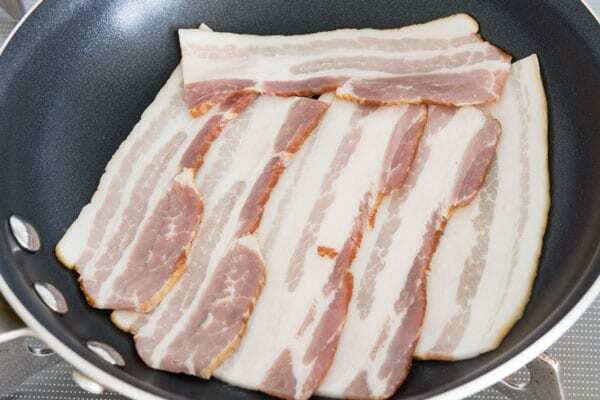 If you aren't using bacon, you'll need to add a few teaspoons of vegetable oil to the pan. Add a third of the cabbage mixture into a mound on top of the bacon. Press down on the mound using a spatula to flatten out the top and then push the edges back towards the center to make a round pancake that's roughly the same thickness from edge to edge (it should be about 3/4-inch thick). Cover with a lid and cook until the bottom is well browned (about 7 minutes). 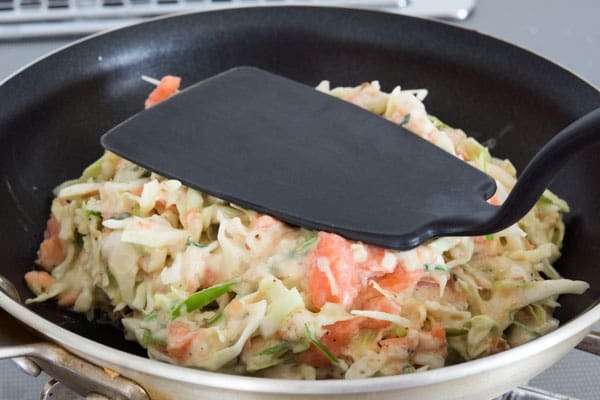 Flip the okonomiyaki. If you are unsure about your flipping abilities, lightly oil and preheat a second pan, then you can use the second pan to cover the first and flip the okonomiyaki straight into the second pan using oven mitts to hold the hot pans. Press down on the top of the okonomiyaki with a spatula and cook uncovered until the second side is browned as well (about 7 minutes). Slide the okonomiyaki out of the pan onto a plate and top with chuno sauce, mayonnaise, aonori, katsuobushi and benishoga. I’m a huge fan of mentaiko, especially in okonomiyaki. But there is just no where you can find in Sweden where I live. Do you know any way of getting around this and maybe imitate the the flavor by using some other kind of caviar and spicing it up? I love how hard Step 10 is to describe in words when it’s such a simple action. Is there any way to substitute nagaimo? I’m afraid it’s impossible to find in Poland, where I live. 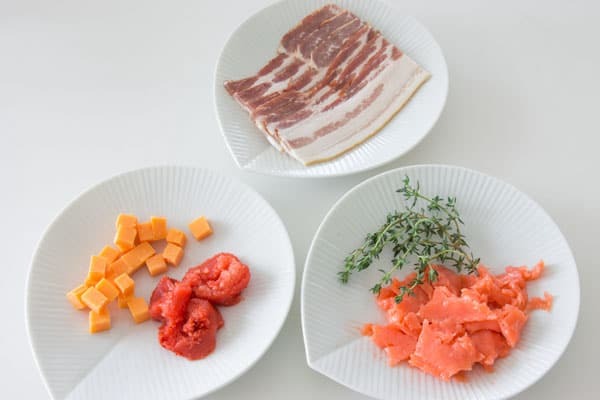 Lovely…..I like this step by step picture…Its good for beginners to prepare japanese cuisine……..
Hi, Marc! Thanks so much for sharing your work. I’ve recently moved to Japan so I was looking for some easy to follow recipes. Today I tried a vegan version of your okonomiyaki. I left out the bacon and katsuobushi and I replaced the eggs with more nagaimo. Basically, I doubled the quantity of nagaimo. I was divine!! I’ve just finished eating it and it feels a little like being in love, haha! Thank you so much! Hahaha, it’s okay you can be divine too;-) Glad to hear you enjoyed it and great idea subbing extra nagaimo for the egg, I often use nagaimo or grated renkon (lotus root) as an egg substitute when I’m cooking for vegan clients. If you have some, nutritional yeast makes a great substitute for the meat/cheese in this to add a bit more flavor. Great tip! Thank you, I’ll give it a try! Hi Jacob, yes, it makes 3 ten-inch okonomiyaki. Hi Marc! Can I substitute a gluten free flour for the wheat flour – such as brown rice flour? Thanks! Can I use turkey bacon? Can’t use pork for religious reasons.